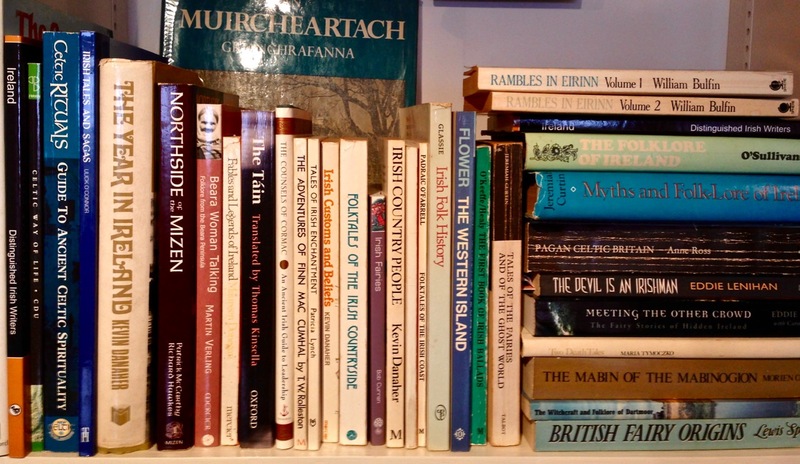 Four years ago I wrote about the fishing industry that once flourished on the shores of Roaringwater Bay (and around much of the west coast of Ireland): according to extant records it was active before 1500, and probably had its heyday in the seventeenth century, when it was heavily invested in by the Great Earl of Cork (Richard Boyle, sometimes described as ‘the richest man in the known world’). 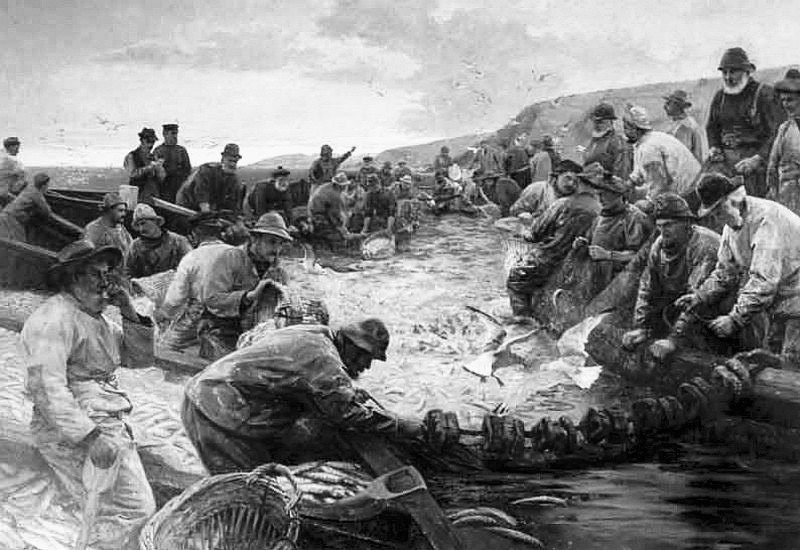 In those days, pilchards were the main catch: huge shoals of them came to the comparatively warm, sheltered waters of the islands during the summer months, along with other oily fish such as herring and mackerel. Seine boats were commonly used for this enterprise. Today, pilchards are rare: through a combination of overfishing and changing climate, the bountiful shoals no longer appear. There were two boats per seine net, the seine and the faller. The seine boat was 27 foot long with a beam close to nine foot. The golden rule on the Northside was to never get into a boat whose beam was less than one third its length. The seine boat had five oars of about 17 foot (bow, Béal-tuile, aft, bloc and tiller oars). 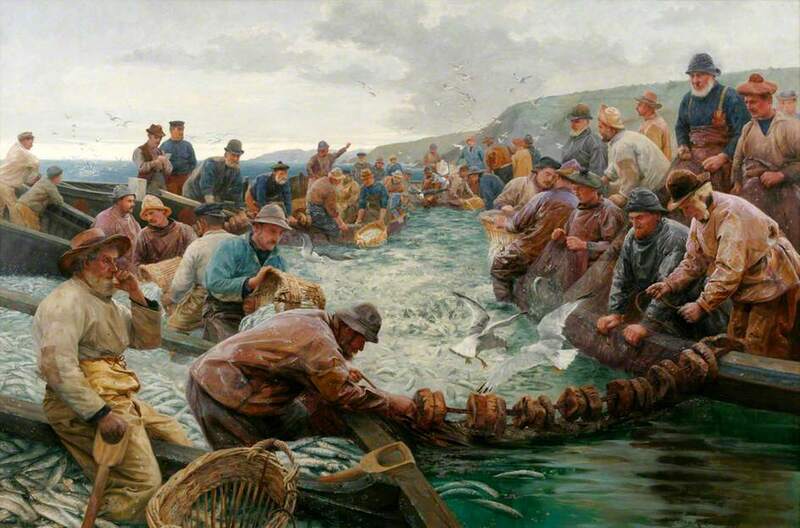 The crew of seven had to shoot the seine net; one man shooting the trip rope, another to feed out the bunt rope, four men rowing and the huer (master of the seine and captain of the boat) directing the operation. The faller (or bloc) boat was 24 foot long with a crew of five. Its job was stoning and to carry any fish caught. The largest load a faller could carry would be around 5,000 fish. All boats carried a Crucifix and a bottle of Holy Water. If the fish are gone, remains of the machinery of that industry are still to be seen. 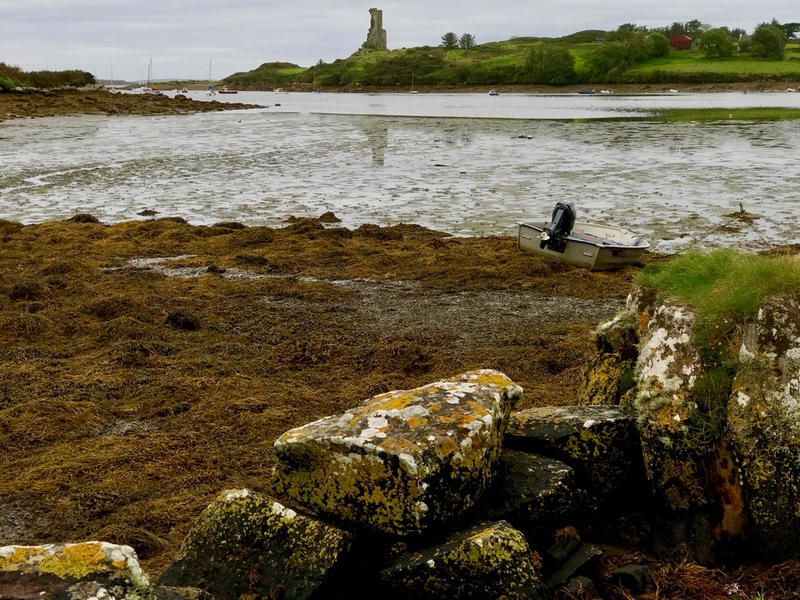 In particular, the sites of some of the curing stations – or Fish Palaces – are visible, and are recorded on the National Monuments Archaeological Survey Database. 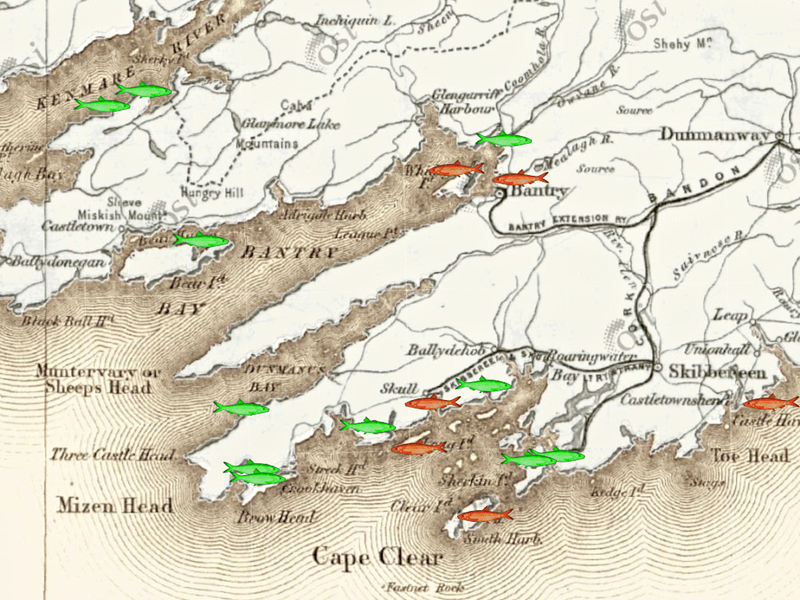 Take a look at the map below: I have drawn green pilchards to show the sites of fish palaces mentioned in the database – eleven in all on this section of the map. 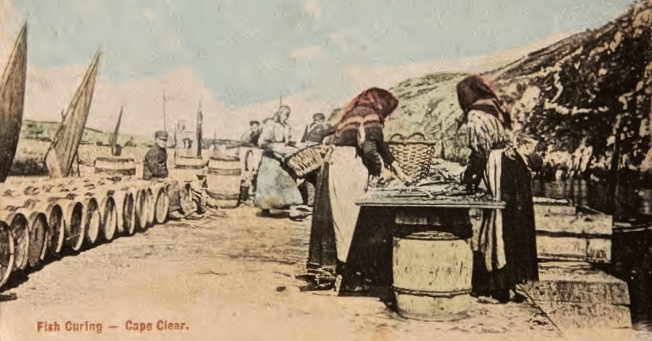 Also shown by red pilchards, however, are the sites of another six ‘curing stations’: these are mentioned in a long article by historian Arthur E J Went, Pilchards in the South of Ireland, published in the Journal of the Cork Historical and Archaeological Society in 1949: Volume 51, pages 137 – 157. 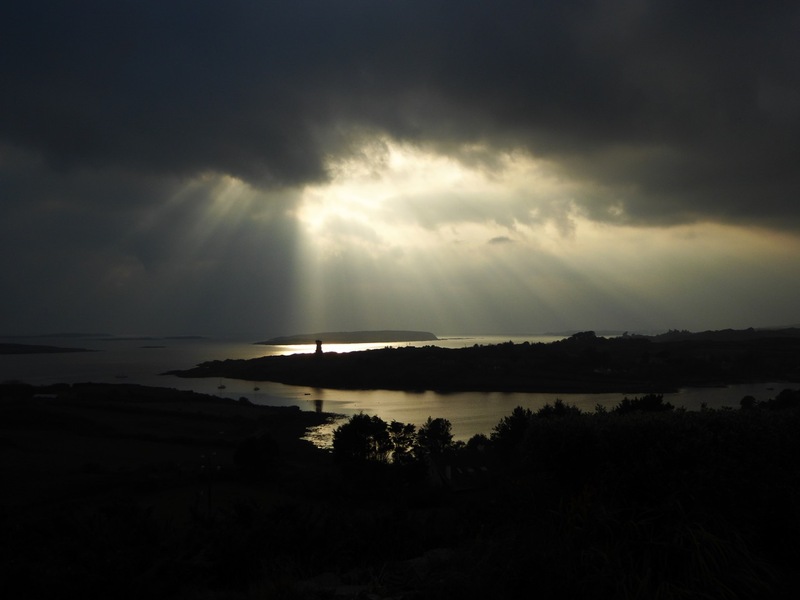 The active fishing of pilchards on a large scale in Ireland has been discontinued for many years so that, unlike Cornwall, there is little left, apart from published records, to indicate its former importance. There is, however, published information as to the methods of fishing, and a few sites of old curing stations, frequently called pallices, can still be identified. 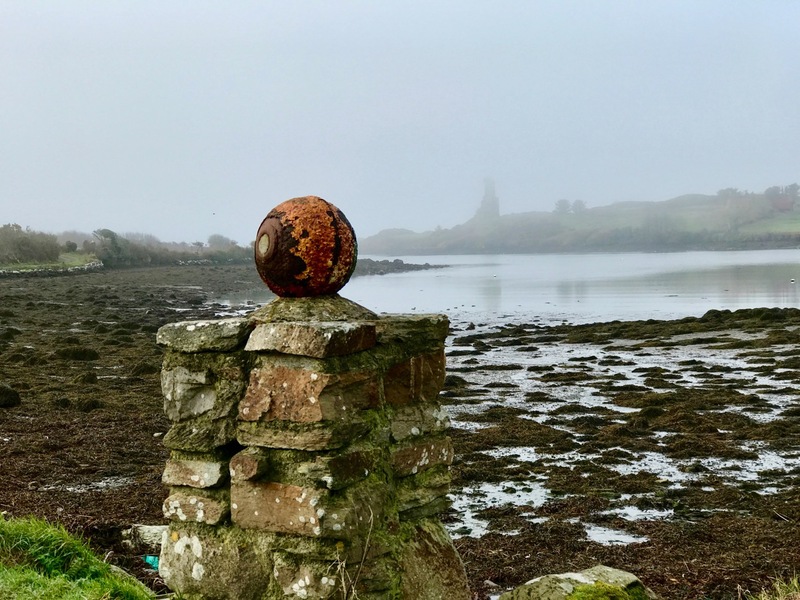 As explorers of all things historic and archaeological – particularly in West Cork – Finola and I couldn’t resist visiting some of the sites of Palaces – or Pallices – documented in these studies. 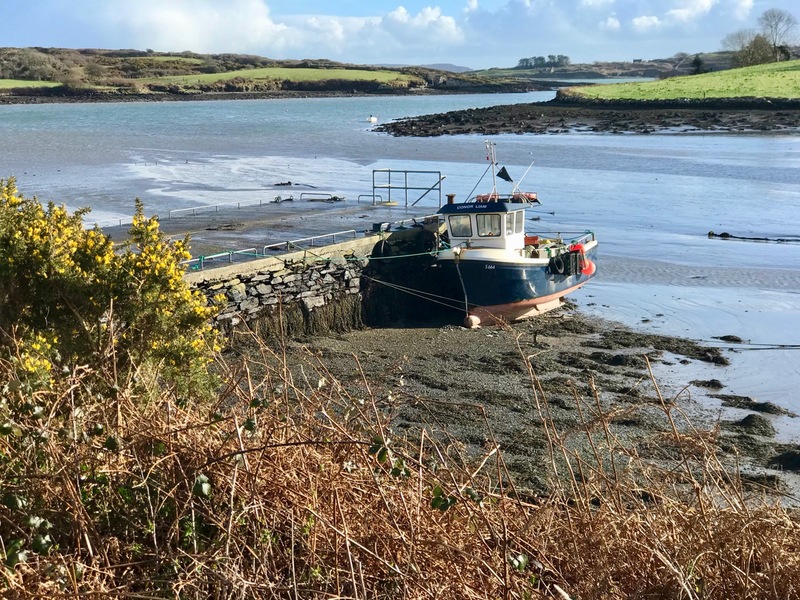 We have always know about the one nearest to Nead an Iolair, in Rossbrin Cove – it’s just down the road: a perfect sheltered harbour, although it does dry out at very low tides. However, there seems to be some debate about exactly where this one is located. 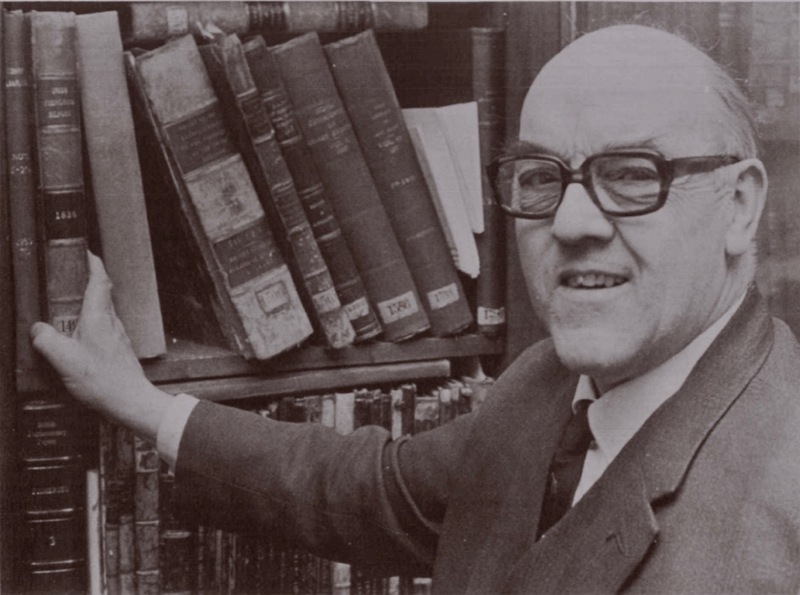 It would date from the time of William Hull and the Great Earl of Cork, so how much would be left after 500 years? 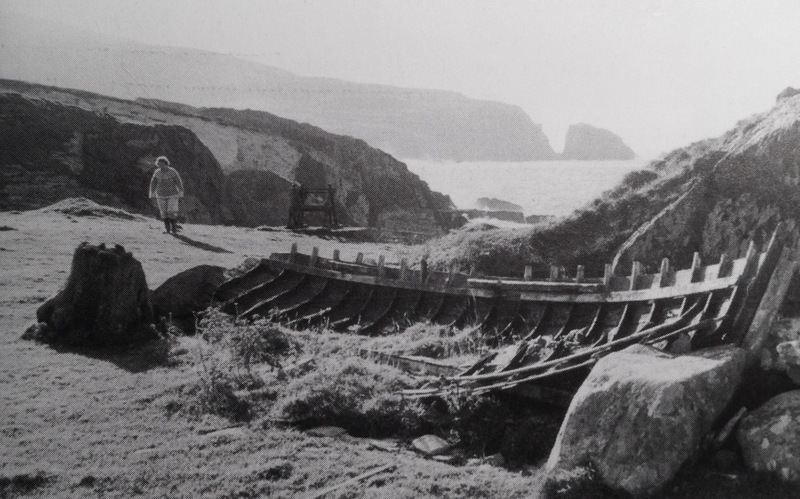 There is a field on the north shore of the Cove with an old name: The Palleashes which, according to Arthur Went (quoting local tradition), was the site of a curing station for pilchards, operated by the ‘Spaniards’. There seems to be some difference of opinion locally as to which of the many small fields here is the actual site, although it is likely to be close to the large, now modernised quay, as this shows up on the earliest maps. In the upper picture: the quay at Rossbrin is still used by small fishing boats today. 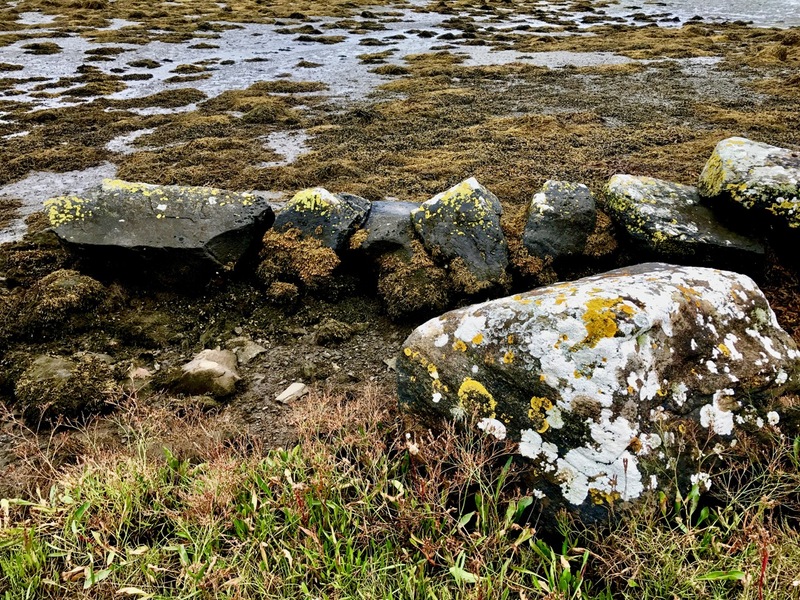 Centre – the field above the present quay may be The Palleashes, and therefore could be the site of the medieval fish palace: there are very overgrown signs of stone walls here. 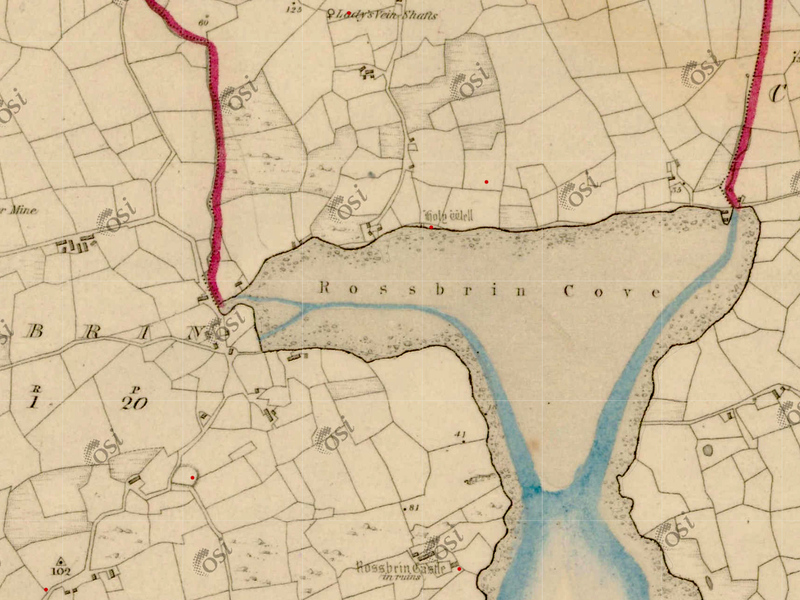 Lower picture – the old 6″ OS map, surveyed around 1840, shows a lane accessing the area above the quay (to the left of the ‘Holy Well’ – that lane is no longer there today) and there are buildings close to the shore which could indicate the palace. 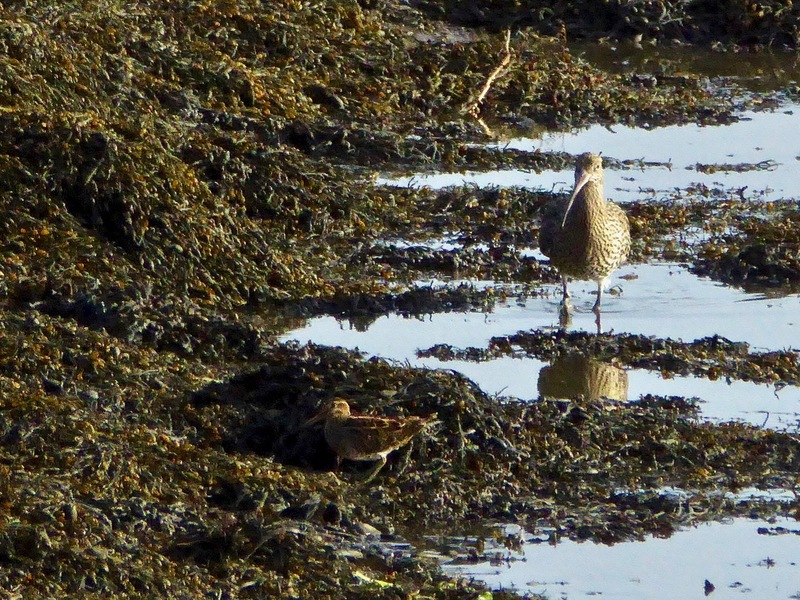 In 1840 there was no road running along the north shore of the Cove, but the strand at low tide would have been used as a thoroughfare. Just above the ‘Holy Well’ indicated on the shoreline – and slightly to the right – is a small red dot. This is the area shown by Arthur Went as the possible site of the fish palace (and subsequently marked as such on the Archaeological Database); in my opinion it is more likely to have been directly accessed from the water. 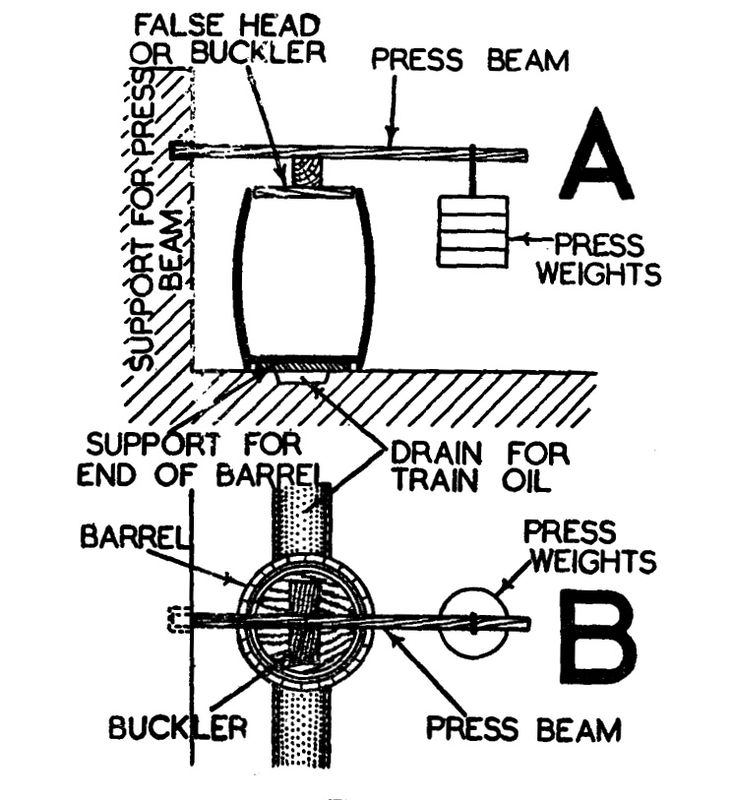 The ‘Train Oil’ – produced from the compressed pilchards – was a valuable commodity, and was collected to be stored and used for treating leather, and as fuel for lamps. As a by-product of the pilchard industry it was said to be as valuable as the fish themselves. 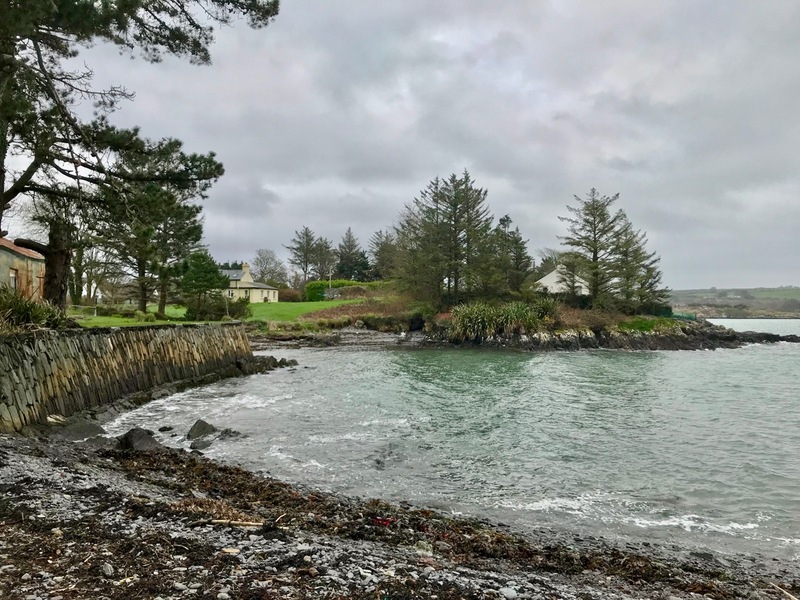 To continue my researches I went along to Schull, where Arthur Went mentions a ‘Palace House’ on ‘Palace Strand’ – an inlet just to the east of the main harbour. 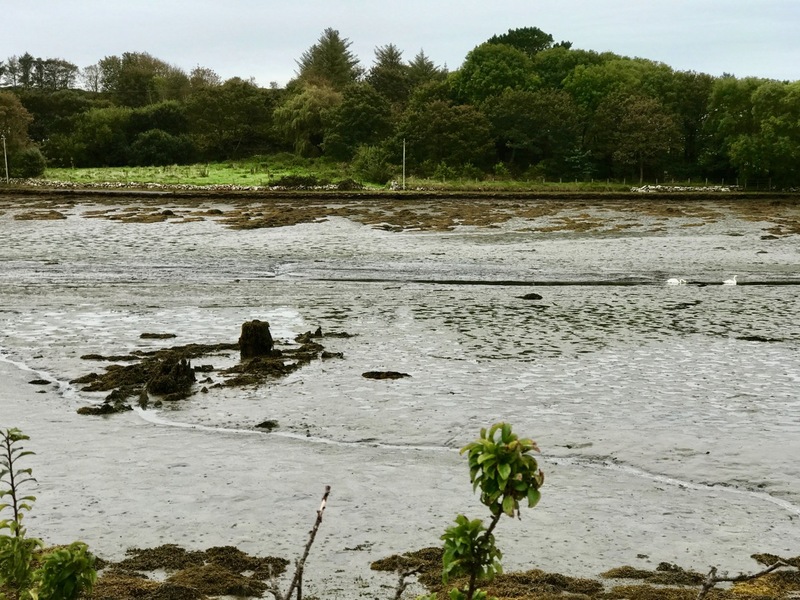 This is right beside the old railway station which was not quite the terminus of the Schull & Skibbereen Railway, as a spur went on from the station to serve the harbour itself. 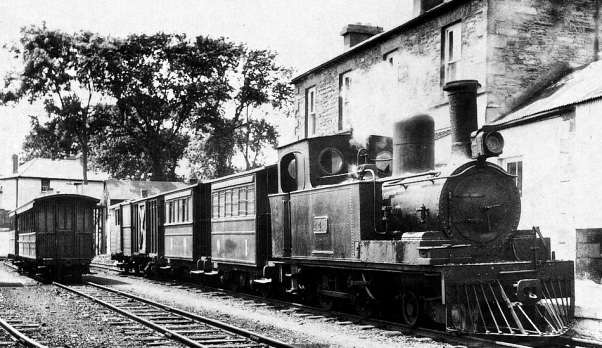 The station buildings and part of the platform are still there – now a private residence. I could not find anything in the area shown on Went’s map at the east end of the strand, but I did find something at the west end. 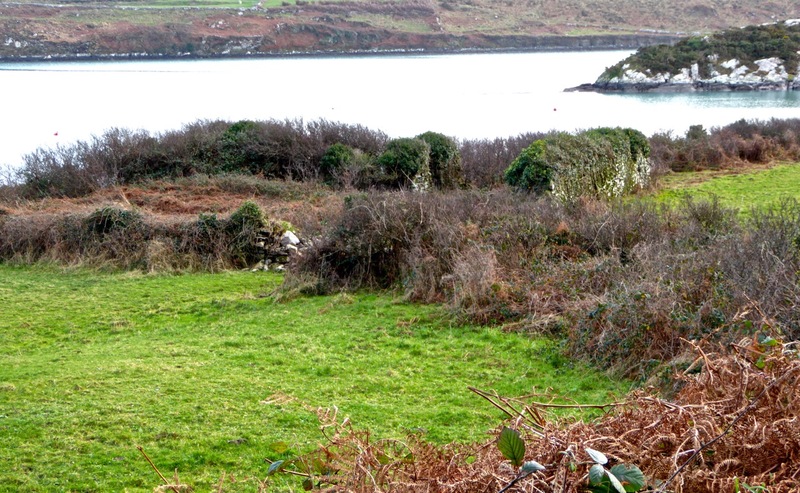 In the upper picture is a wall on the western boundary of the old station site in Schull. 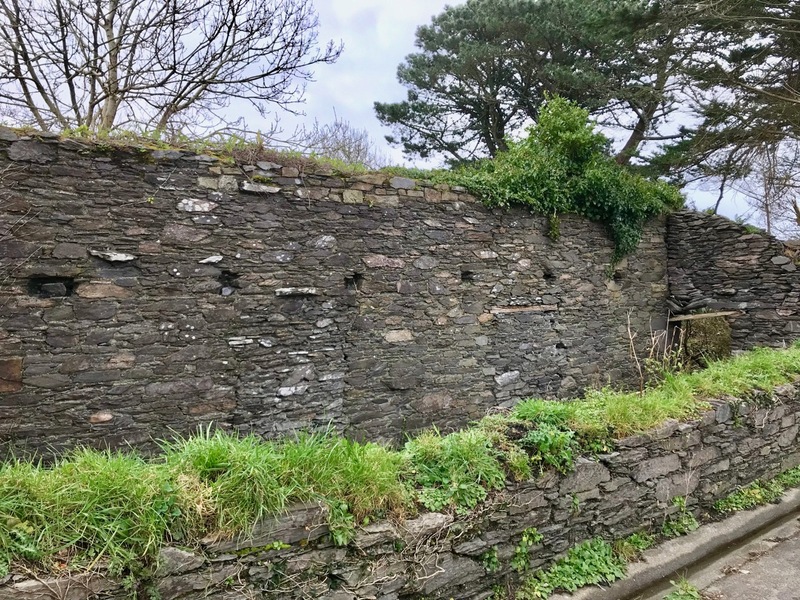 This contains beam holes very similar in size and spacing to those we have seen in fish palaces elsewhere: it’s very tempting to think that this wall – now part of a derelict building – may have had this purpose, as it is well situated close to the shoreline of Palace Strand. If this was a fish palace, it is also likely to date from the nineteenth century, as the early Ordnance Survey maps don’t indicate it. 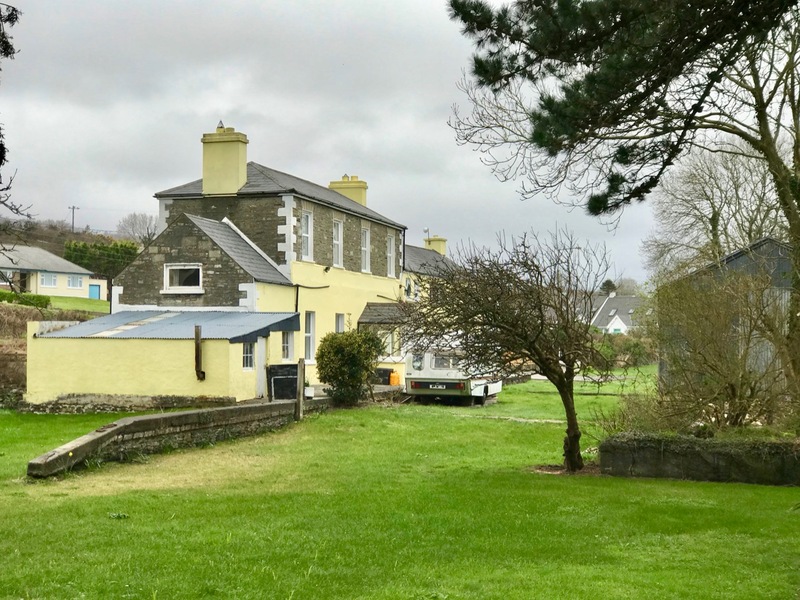 The centre picture shows the old station buildings today, and the lower picture taken at Schull Station in 1939 reminds us of past times: the railway closed in 1947. 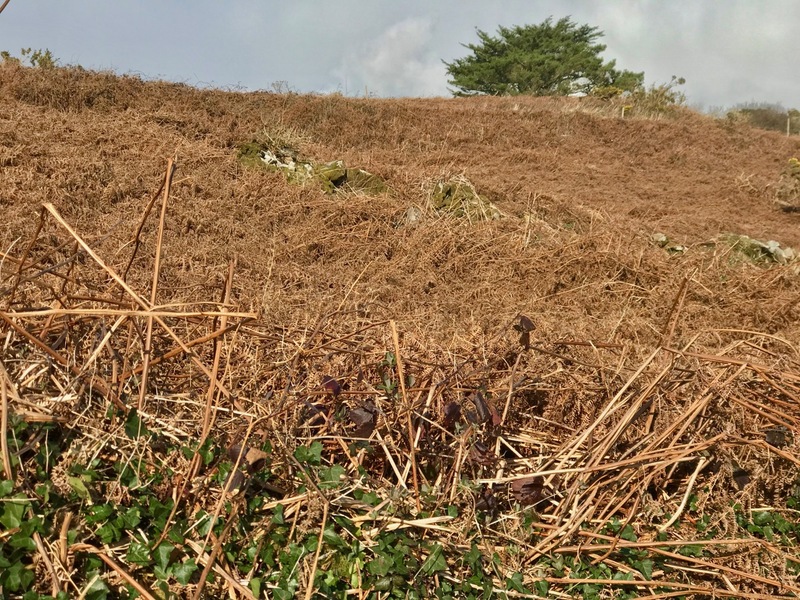 A little while ago I described an outing we undertook exploring some of the archaeological sites on the Mizen Peninsula. We were out again a few days ago checking on some monuments off to the west of us. I had researched the Archaeological Survey Database, and determined to have a look at the ‘Fish Palace’ located in the townland of Leenane, close to Crookhaven – evidently a substantial establishment set up by Sir William Hull and his business partner, Sir Richard Boyle, first Earl of Cork, in 1616. 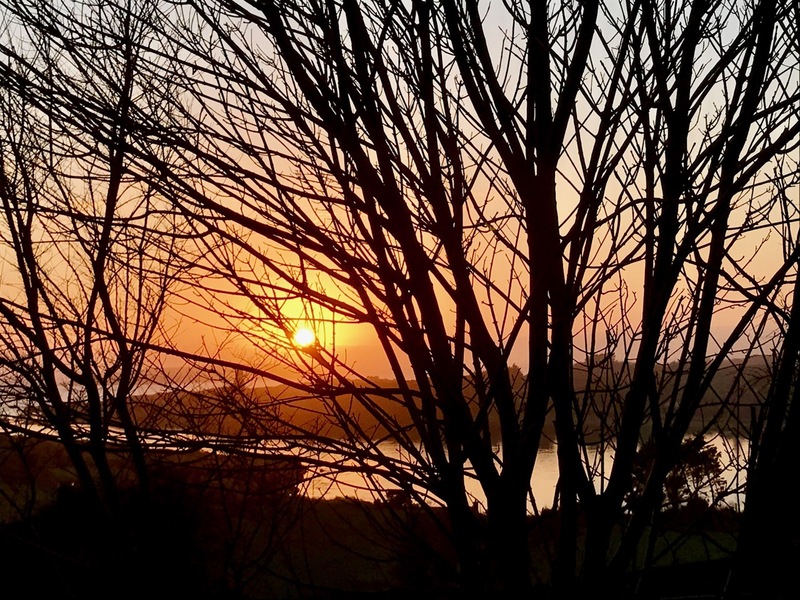 Hull was a notorious character – his family home was Larkbeare, near Exeter in Devon. 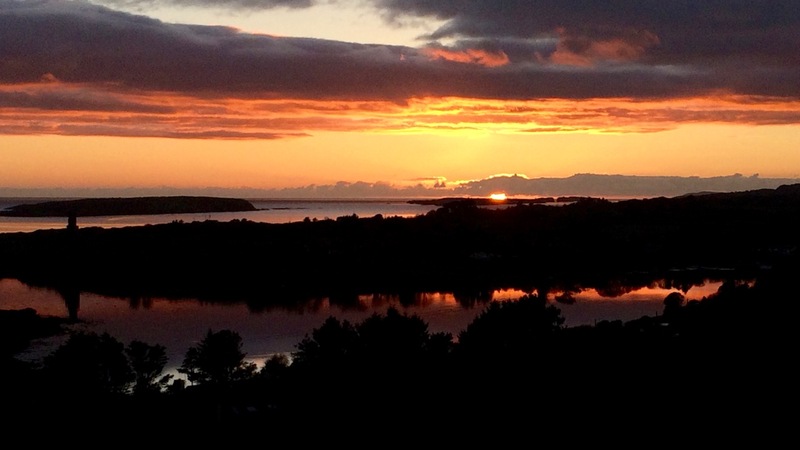 He had been appointed Deputy Vice Admiral of Munster in 1609 under James I, and settled in Leamcon near Black Castle or ‘The Hound’s Leap’, one of the O’Mahony castles built along the coast of Roaringwater Bay. Set on a promontory into Toormore Bay, Leamcon is one of the most defensible of these, only being reached by crossing a narrow bridge. 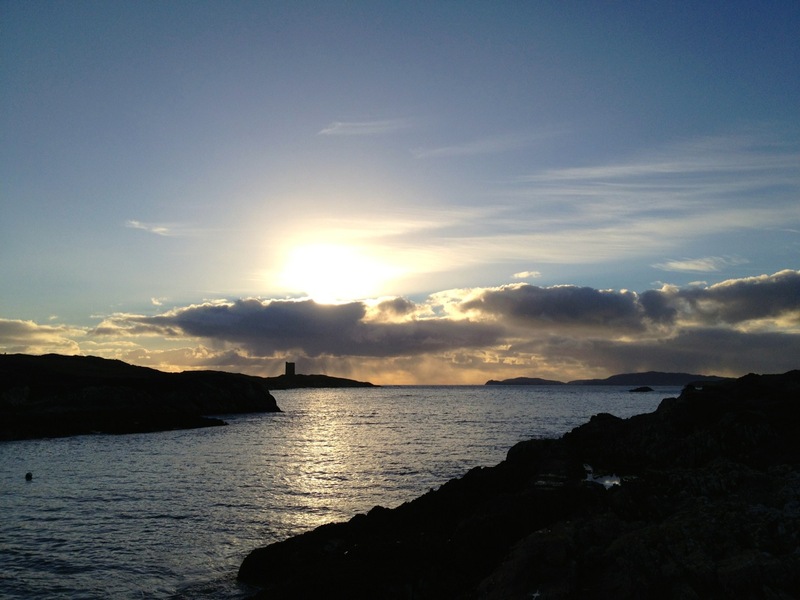 Hull’s job was ostensibly to protect the southern Irish coastline against piracy. In fact, the post seemed to encourage collaboration with the pirates, where it would financially benefit both the Admiralty and Hull himself. All this has been ringing bells with me: firstly, because I know from the map that a Fish Palace once existed down below Nead an Iolair – overlooking Rossbrin Cove and Castle – but no trace is left now, except that the field there is still known as ‘The Palliashes’; but secondly because when I lived in Newlyn in Cornwall I looked out over Mounts Bay, where a pilchard fishery had been active since the 16th century. This was a huge business, whose heyday was the middle of the 19th century. 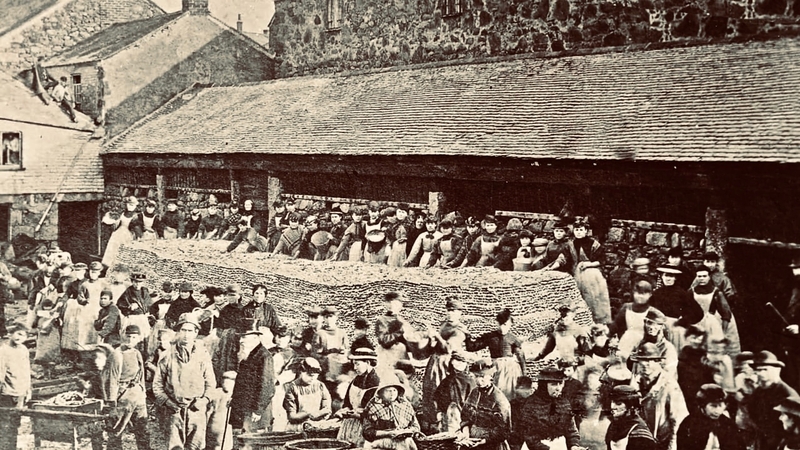 Pilchard quantities are measured in ‘hogsheads’ – one hogshead holding 3,000 fish: in 1847 the exports of pilchards from Cornwall amounted to 40,883 hogsheads or 122 million fish! 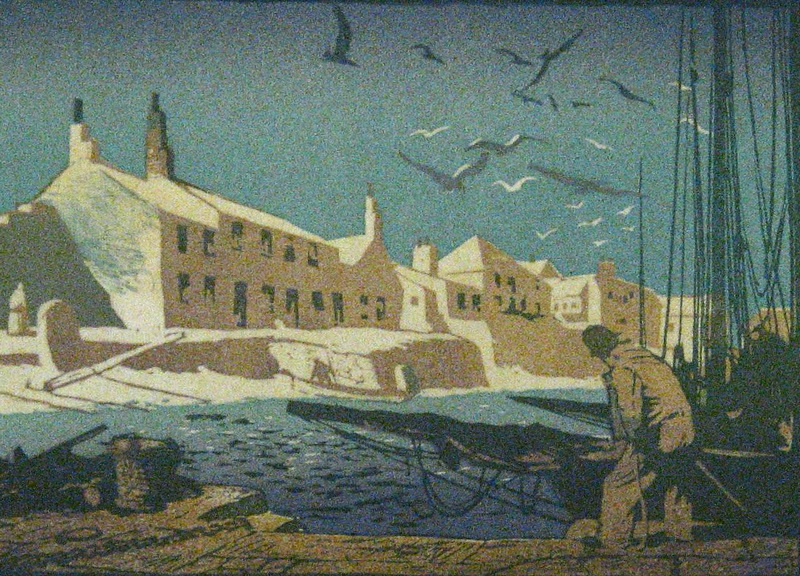 By good fortune we have a pictorial record of the activities, as two of the Newlyn School of Artists chose seining as the subject matter for two impressive paintings. In the good times Mounts Bay was brimming with seine boats. 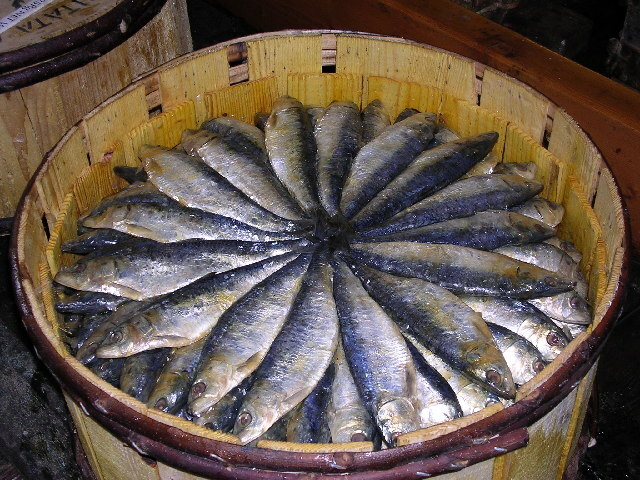 The pilchards were harvested during the summer when the shoals swam in close to the shore. 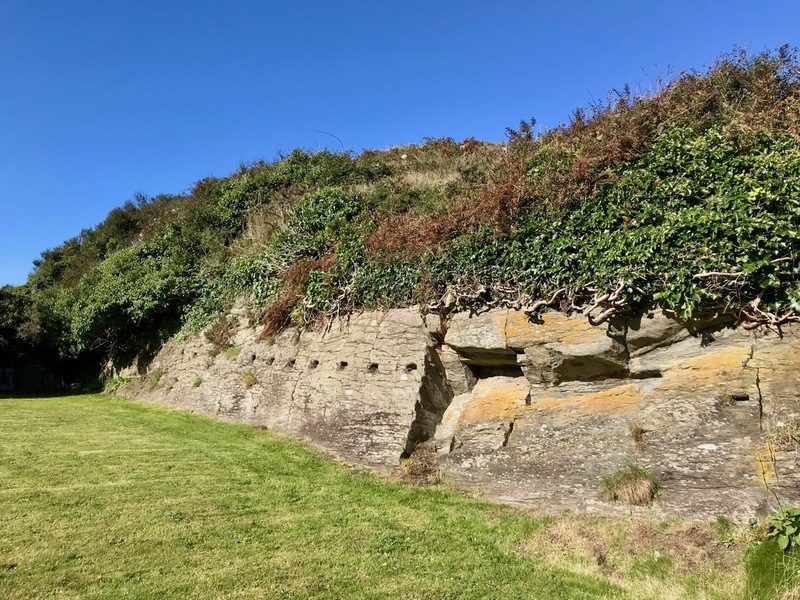 Lookouts known as Huers were posted on the cliffs, from where the shoals could be seen and semaphore signals were sent out to the waiting boats who let out 400 yard long nets to surround and trap them. The nets were kept upright by floats at the surface and weights at the bottom, presenting an impenetrable wall to the pilchards. 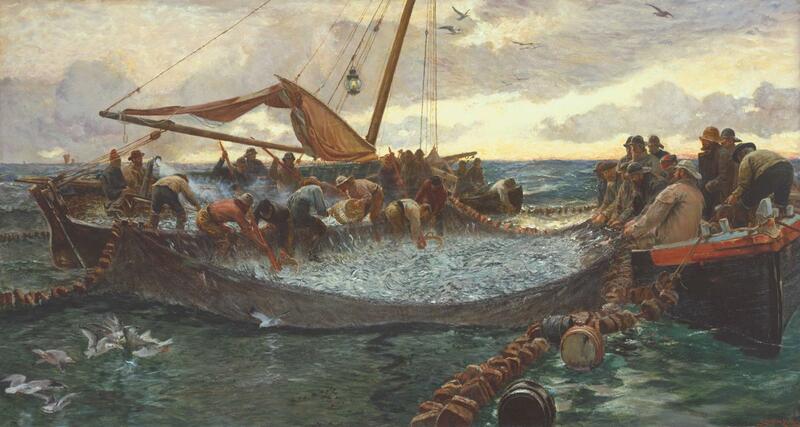 The pilchards were then removed by smaller tuck nets and loaded into punts and carried ashore. 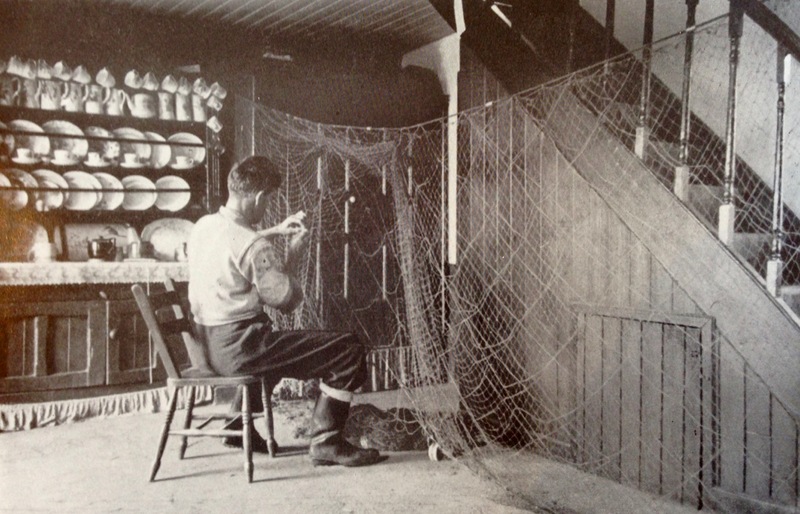 The seine net provided a convenient keep net in which the fish could be kept alive and fresh until they were processed. 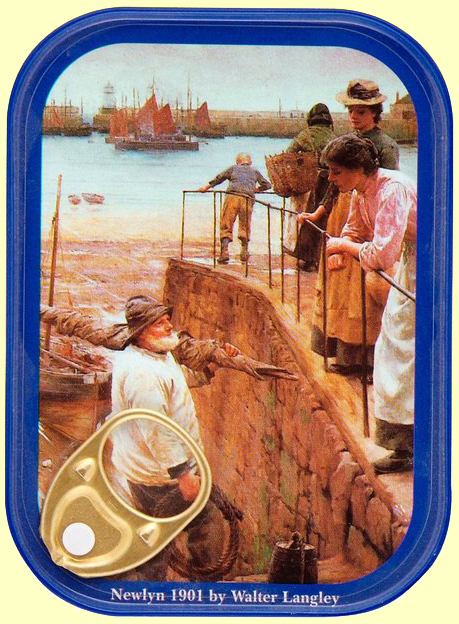 During my time in Newlyn there was an active pilchard processing plant – now closed down – but I was fortunate enough to visit the works and see the pressing and preserving taking place, using exactly the same methods that William Hull’s workers employed four centuries before. 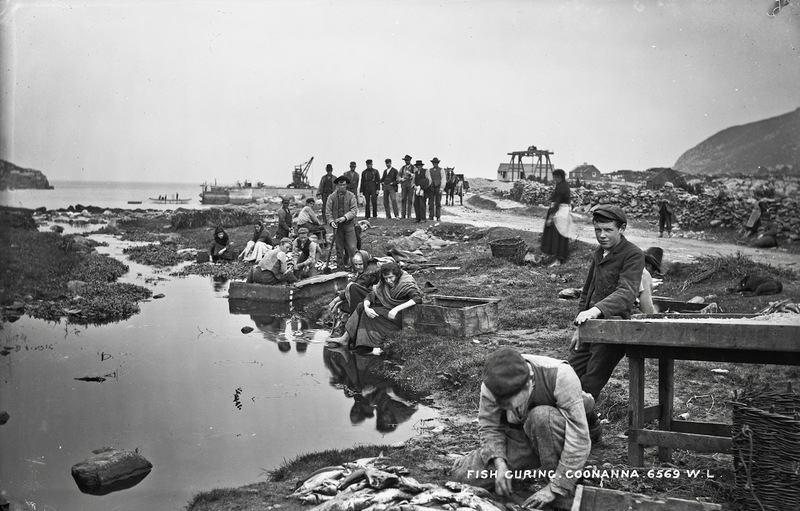 Just as in those earlier times the main markets for the processed fish were in France and Spain. 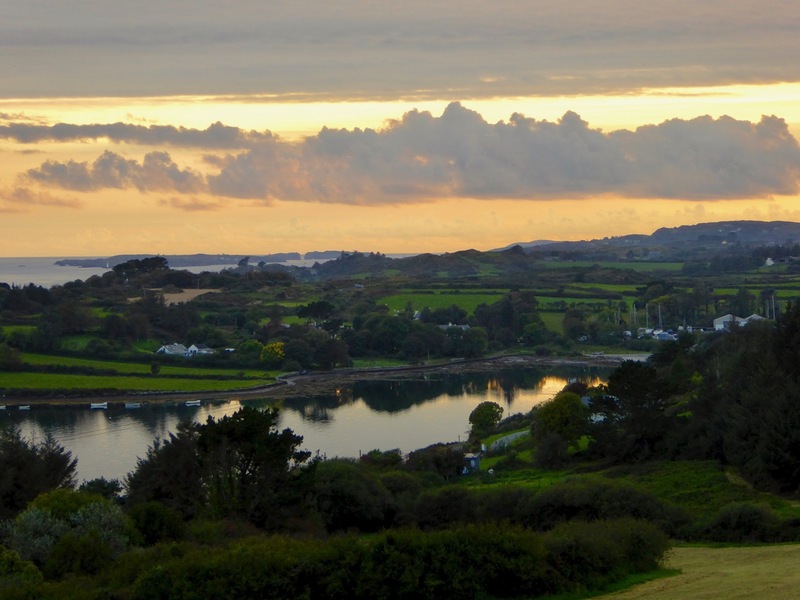 As in Ireland, the pilchard shoals severely declined – probably because of overfishing – and the industry followed. 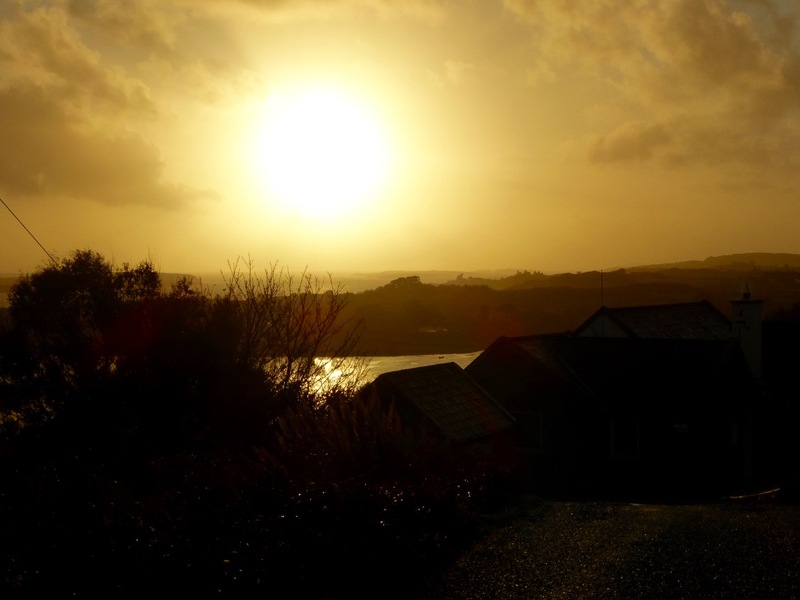 Nowadays there is a small amount of pilchard fishing taking place in Cornwall, but it is barely viable.